Look no further. Our wonderful Hetty is versatile and adaptable, enabling us to offer a wide range of catering offers for our discerning clients. Hetty comes equipped with a Barista Style espresso machine, enabling us to serve Lattes, Cappuccinos and Espressos from dawn till dusk. We have an ice-cream fridge for delicious ices and sorbets, a fridge for cool drinks (alcoholic or not) and hotplates for us to serve piping hot Crepes, Street Food or just the best locally sourced hot dogs and gourmet burgers you have ever tasted. Hetty has lots of display space, enabling us to show off our range of delicious cupcakes, afternoon tea experiences or our strawberry and cream spectacular! Later into the evening, Hetty turns into a sophisticated Prosecco Bar, complete with twinkling fairy lights and music. 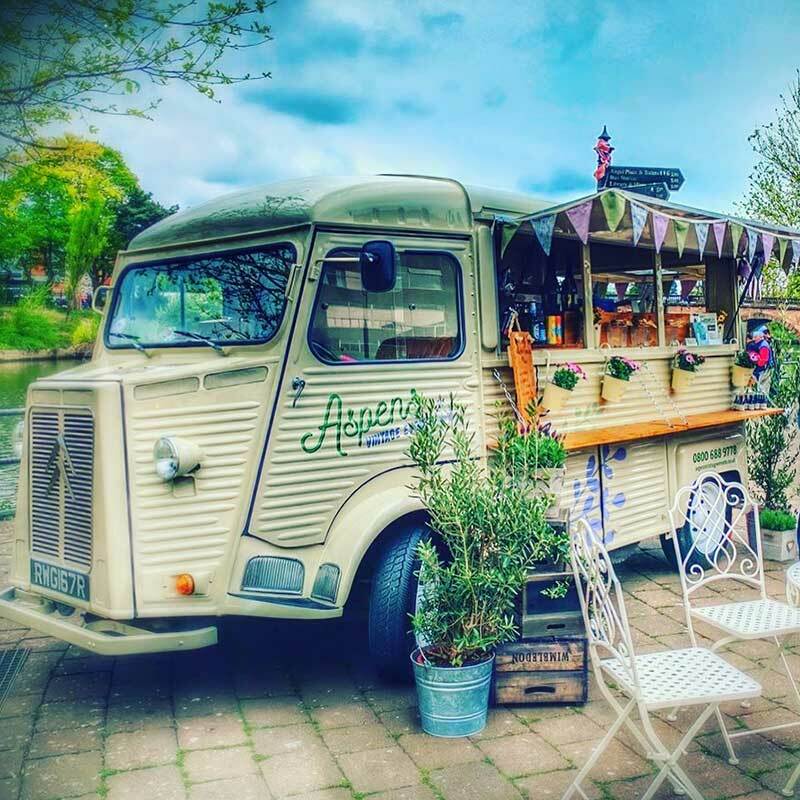 The versatility of the vehicle is supported by our Aspens Vintage Events branded Gazebo with rustic Bar, commercial BBQ's and ovens, delivered to site via our Vintage Events refrigerated support vehicles. With equipment such as this, our offer to you can be tailored to your specific requirements making your special day truly memorable. Your event begins with careful planning by our Aspens Vintage Events team. We will meet with you to discuss your requirements, show you the range and variety of what is on offer and will jointly plan how to make your event go with a swing. Our experienced party planners are supported by an army of associated partners - everything from florists to balloon suppliers, live bands or recorded music, we can manage everything - all you need to do is relax and enjoy your day, safe in the knowledge that with Aspens Vintage Events, everything will be taken care of.